MoneyWorks was built from the ground up for the needs of business, finance and accounting professionals. It isn’t bloated with wider organisational "features" like HR & CRM, that are costly, complicated and need an IT consultancy to configure. Instead you get a powerful, feature rich platform that unlocks your company’s accounting data to help you run a better business. MoneyWorks is fully supported, regularly updated and flexible enough to fit within your workflow and integrate with your existing business software. You need your accounting software to fit in with your business processes, not the other way around. Designed for maximum flexibility and interoperability, MoneyWorks allows you to structure your accounts to match the needs of your business. MoneyWorks can interface seamlessly with most leading payroll, CRM or POS systems, and generic systems like FileMaker Pro, MS Office or mySQL, making it possible to streamline your workflow. Better information helps make better business decisions. Dashboard charts show you at a glance how your business is performing, while on screen lists give you quick access to your data. 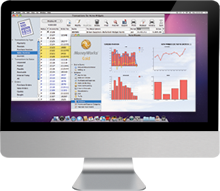 For in-depth analysis and forecasting, MoneyWorks has the most powerful reporting of any accounting system in its class. If the comprehensive included reports and powerful subsummary features are still not enough, the MoneyWorks Gold report writer makes it possible to create the exact reports you need. You need software that won’t bog down, wasting valuable staff-time (and hence money) through slow operation. MoneyWorks is fast. People who have switched from other systems tell us that the speed of MoneyWorks is phenomenal, making their operations much more efficient. Comprehensive documentation: facilitates staff self-training. Not tying accounting software to payroll: upgrading accounting software to keep up with payroll rules should not be necessary. So you won't get stung for an annual upgrade that you don't really need. A fully-compatible works-alike product line: no expensive data conversion or retraining if you need to upgrade. Cross-platform support: no repurchase if you change platforms in the future. Effective user interface: helps users get the job done quickly and accurately. Performance: fast, efficient software means staff time is not wasted. No computer degree needed. The friendly interface and graphic workflows make MoneyWorks fast, easy and efficient to operate. Since 1992, MoneyWorks has helped tens of thousands of businesses around the world.